Quests based in dreams and imaginative constructs. Mostly, though, I realized that in all my excitement about Proscenium, and stage magic, and pledge-turn-prestige cycles, and how spatial that poesy is and shmooshes well with Fairy chess…I was developing a new language for the exact same ideas that I ought to have been working on all along: proper Glamour and correct Spelling. Here’s a relevant link to introductory linguistic semiotics. I haven’t read all the way through it; I’ll get to it! I’d been allocating some one-on-one time with every guiser I’d ever met, or at least to pace and focus my consideration for why we would be (or have been) in one another’s lives. Cookson from Captain Foxglove’s crew told me that I’m too angry for him (Kelp Cookson) to want me to get to know him better. So for once, I thought to work on that, because I’m so reluctant to let go of anger that tells me enough is enough after a lifetime of being some weak, kind, doormat of a person…and I still don’t feel that “not being enraged and embittered anymore” is a choice that I consciously made, with step-by-step instructions to repeat next time anger starts giving me acid reflux and a pirate’s vocabulary. But I feel much better now, and I think it’s going to last. Next on the list to plan some quality time with is Queen Myrtha of the Wilis—who only shows up when my anger has evaporated into this unadulterated, concentrated venom that even I sometimes mistake for calm rationality. But, the Queen’s been around several literal hells of a lot more often than Kelp “Simmer Down” Cookson…and when it’s mattered, too. But the timing’s wrong, but I should practice making things I think and want to happen actually happen instead of leaving it always up to timing, but I probably should, but I really shouldn’t, but I want to not want to…eh, she showed up in the Otherreal for the first time last December, so maybe she’s a seasonal guiser. Rose ought to have a better introduction than this. I was in my mid-teens, mulling over gritty reboot fairy tale retellings that I could do, and she was one of them. I could have sworn that I’d seen Rose as Chelsea Hobb’s Gerda in The Snow Queen (Hallmark, 2002) but apart from the ringlets she’s given when she’s trapped in springtime, there’s not much resemblance. Which is odd, because her actual face and body keep changing whenever I meet her. 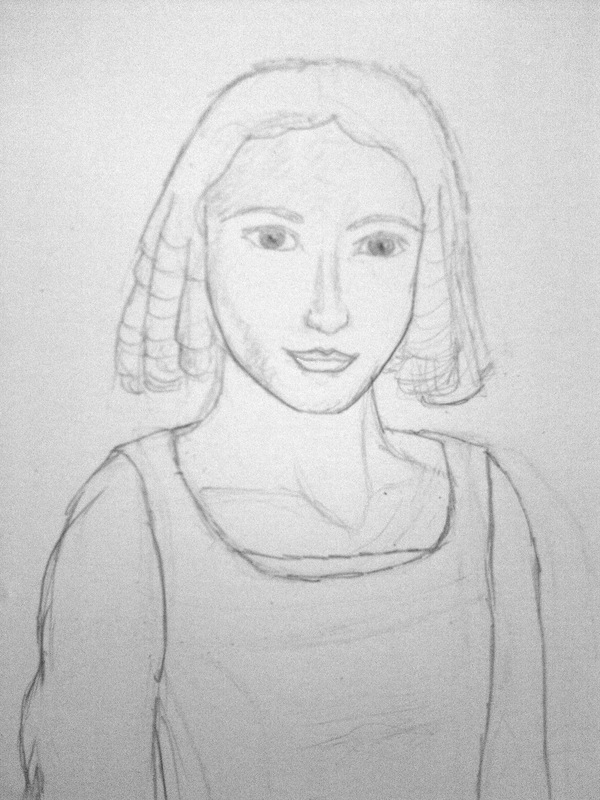 The drawing above is of the youngest-looking version of her I’d encountered, who seemed to wear a specific world all the time. And during our most recent encounter, I was going to suggest that she leave it. This time, it was an information dump. I’d taken it as a given that the center of the red brick labyrinth is a walled garden where Rose would sit with her tea set. And I can never find the door. If she randomly wants me to join her for tea, I am randomly summoned there for tea and randomly banished. We never do anything else. What? My corporeal-sidereal mind pulled away from myself a bit. What did we do this time? What did you do?!? This isn’t happening. That’s an exaggeration. I didn’t answer, because I didn’t ask. I only felt moderately confused by myself. “Nobody can find this place,” Rose said, meaning that she wasn’t leaving. 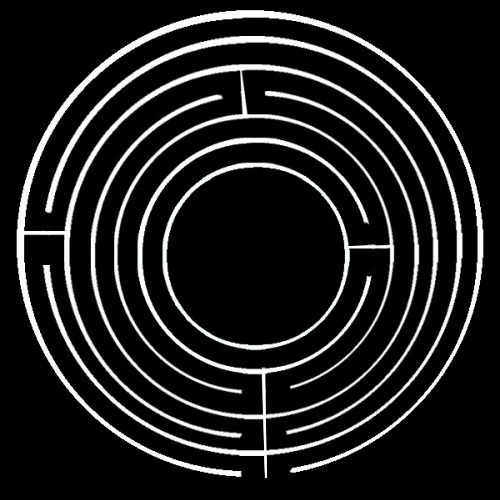 I’d pointed out that the labyrinth remained open to the sky, but…she had a point. One entrance, one exit, one winding path, and I’d still manage to take a wrong turn. Rose knew this place better: the place did whatever she wanted to whoever else was unfortunate enough to wander into it. Of course she was safe, here. I might have gesticulated between us and the walls, bleating, to try to communicate that if I could find the center garden of my own volition for once, and Foxglove could do the same and they hadn’t even met, then the security wasn’t very good anymore. On the other hand, Foxglove and Rose kept looking at each other with expressions that at least told me that they knew one another very well. So Rose listened to Foxglove after he’d made the exact same report to her, and suggested the exact same course of action as I had—and without any argument at all Rose wrapped up her own tea set in the tablecloth and looked to the bottom of the stone bird-bath for pearls. “There are seashells in almost any harbor we stop at,” Foxglove told her, though he’d looked terse, he’d kept his tone encouraging. Rose decided not to waste time on the pearls. She had a flower crown that she’d reached up to put on Foxglove’s head. It got there; they’d both looked so solemn about it. I could make sense of it. Before, I thought that I’d found Rose by a slightly different form accompanying Captain Marigold, and when I’d looked in that one’s eyes she appeared empty of any mind. I wonder now if this exact moment was always going to happen, so that the shell that followed Marigold around would be ensouled by a real Rose. Maybe the shell was a sort of ghost from the future. I’d stopped this Rose, right before she left, to look in her eyes. I couldn’t. It was like starting mirror work, and all I could see was a mirror. This Rose wasn’t empty that I could see, but all I could see when I looked at her eyes were…eyes. Despite being sort-of around for a decade, even despite all the tea parties…this was, really, the first and only conversation-like exchange that Rose and I had ever had. I’d described her before as “too obstinately enigmatic to blog about” and maybe that is the thing: she’ll always have a labyrinth of some kind around her, maybe she is safe and content by nature, inherently inaccessible, and I had made some grave mistake in sending her out into the world. Even if she were going to bring life to Marigold’s pet ghost from the future. Nah, Foxglove’s made the grave mistake, if that were the case, because he’d said the same thing but she listened to him. Besides, one of Foxglove’s crew had eyes pop out of sockets at the end of accordion springs when I looked into them. Had they been coil springs, I would have guessed that mechanism were built into such a guiser-body to facilitate expressiveness in the eyes. That they were accordion springs swayed my suspicions more towards that every otherworld I quest in is potentially trolling me. So they both left. Somehow. I didn’t catch them going over the wall, but the center garden of the red brick labyrinth has no door. My beloved became a collection of net-hole shaped pieces as the threads fell through him, though it can’t have been heavier than a cobweb. I suppose the physics of the otherworld, the metaphysics, are largely signifiers. I thought I’d been here before, although hadn’t, I thought I’d watched this happen once or twice before—not to someone I knew who blessed the air with every exhale, who would stop my chest from aching just by consenting to my holding him in my arms. Of course this was “different”, an “exceptional case”, of course: I was upset. Pieces of him fell bloodlessly, though, which my imagined memory compared to the others who’d burst—tellingly. Nothing! I’d answered, because I had nothing suitable for pledging, which itself is unsuitable for pledging. I lose my mind fairly frequently, so I might not have had it with me. Despite my crying over somebody else getting hurt, I was sure I was heartless. I couldn’t pledge any service with a lifetime of learning that I’m useless. Mostly, though: Do it, or don’t do it! But you know what’s right! If that’s call to close the gate against me, so be it. Even in my despair and desperation, I trust the Clarene’s judgment. The Clarene melted away—into a more godly-cosmic form, as I can only imagine one does when one is a god—or summoned away maybe? I don’t know. My beloved resurfaced from the earth, whole and sleeping. Before I could thank the gods, though, the Spider tsked and threw the net again. I heaved his body away at the threat of eir movement, too slowly: a thread caught on his left forearm, and the hand fell away in chunks. Those didn’t sink into the earth this time. The Spider’s marble eyes betrayed no emotion, no reason. I held my beloved tightly—his back to my chest, like I learned in swimming class in the human world, to rescue someone who doesn’t know how to swim—and found Heartwrench’s hilt had appeared, between my hand and his chest. I’m not supposed to still have this. —there. Like a bubble of glass, or like an air bubble in water, the rind of a sphere appeared around us. With my free hand, I tugged at his jeans, to try to get his feet inside the sphere. Heartwrench’s spheres are only permeable to those and whom I treasure. Usually. A knowledge dusked on me then: Heartwrench’s sphere couldn’t stop Cobb’s web. We floated up, and away. Cobb didn’t even look up to watch us go. Even in the otherworlds, my emotional metabolism is too slow. I was still crying in despair when really, I should have been relieved. I didn’t know where we were headed, on what currents we coasted, through the overcast day into clear late afternoon. I caught sight of a dome in the sky, the average size thereabouts of an airport near a capital city, stained glass in no particular pattern, something like stairs sort of notched around it coming from and back around a single wide balcony. Princess Irene waved us through the balcony opening and into the dome. A description: anthropic, except for the butterfly wings; about as tan as I am, but with slantier features (more refined); hair that could be described as a pixie cut; and wearing something between a toga and a Regency-era gown made out of gauzy veils, so a simple cut and line, but as many hues in the layers as there were in the dome. Heartwrench and I dissolved the protective floaty sphere over a divan, where I laid his body. Maybe I shouldn’t have been relieved: the color was draining from his body, his hair, and even his clothes. Irene shrugged as if to say, “If you’ve got to, you’ve got to.” Then she wandered back to the balcony. In my experience with the otherworlds, if you know enough about somebody—who’s subject to the metaphysics of that world, anyway—and you find a space that has the potential for that somebody to be there, and you project your own expectation onto it…then they’re there. That’s what I call summoning. Sometimes you don’t know them well enough. Sometimes there’s no potential to be intuited. Sometimes we don’t know how to project that expectation. Sometimes, I’m sure, they just don’t want to be there. So then they won’t be there. I backed away and went over to the balcony. I shouldn’t still have this, I thought to Heartwrench, and at the corner of the balcony stood the one who was supposed to have it. She was a warrior princess, anthropic, with a quick smile, armored and caped like the Ophelene, but white—for that moment. The next moment—even before I could say hi or how are you doing here—she began to dissolve, starting from the head, into silvery glitter that fell upwards and vanished. A single orange-red, translucent stone appeared, buoyed up in the last curtain of glitter. I took it and held it into Heartwrench’s hilt until silvery thorns grew around to hold the stone, because that seemed to be the thing to do. From Spenser’s Faerie Queene (Book II, Cant X…okay, the real source material is Shakespeare’s King Lear) I’d called the princess Cordelia—though perhaps she was really Carnelian, some new Crystal Gem from Steven Universe. So anyway, that was odd. After a week, if I didn’t have too bad a reaction to the meds, I could up the dosage to a whole pill. It would take about three months for the brain cells to unshrivel from the damage of depression, and then I’ll have the energy and clarity to do what I used to be able to do. I shouldn’t expect effects right away. Three months. The sort of proto-wishcraft I practiced at that time focused on empirical evidence of psychism, with the idea that the mind was the key. To clear the mind of the usual chatter would invite intuitions, so fellow practitioners claimed. Intuitions could tell us the number or suit of a playing card before we could see, or the thoughts and emotional states of the people around us. Willpower directed forcefully through a clear mind could move physical objects. I could never manage any particularly consistent outside effect. Sometimes, I’d dabble in guided imagery, which would never yield any insightful result. Those quests would usually go in some nightmarish, unhelpful direction. As for within: I could clear my mind, though. I could notice and simply be with the pain, and my mind would go silent, no images would come to mind…and, it was something like peace. This did not improve my attention span, when depression began to dull the world. This did not hold my thought process high as the structures crumbled into ruin. This did not improve my memory, in those exercises to clear the mind, I may only be now but everything else carried over pains and troubles of the past. Myself out of meditation knew that my health was failing and I was losing my mind and I’d never meet my goals, the way everything was going. So, I started on what they gave me. The next time I tried to sit still and clear my mind, the usual chatter would not stop. That one thing I could do from years of regular practice, now rendered impossible by a pill the size of a rice grain. It wasn’t so devastating. Once I decided to act to change everything, my mind, my life, my family’s habit of alternating abuse and comfortable silence, I can hardly complain about the changes. So, I allowed my mind to create images around the chatter. My mind chatter was like that of a crowded, noisy room…like a restaurant, I thought. I saw the milky sunlight through the windows, the swatches of color of so many people’s clothes, heard the chatter and the clatter of metal utensils against porcelain. I could shift my attention to the tablecloth, and the backrest of the chair, and the noise wouldn’t go away. I didn’t quest in a way that occupied my Surreal Fetch, back then, I would always be watching my Surreal Fetch from somewhere outside myself—another reason these quests annoyed me. This time I was embodied, I knew, seated and smoothing over cloth. Then I saw myself approach my table, and draw a chair to sit across from me, and sit and watch me. Ey was ready to listen, and to talk. Much as I loved biology class and the neuroscience unit, and the security it lent me in that I was doing a factually correct and right thing, it’s not what prepared me for the shift in value priority: Forget empirical evidence of telekinesis. This was our life on the line, so now this was the Work we’d do. The skin over my sternum felt as though someone had rubbed mentholated ointment over it, though I was certain this wasn’t the case. When I’d looked up models of the Fetch in other traditions (Otherreal, or Sidereal) I wondered if this were some vortex of compassion activating. Incidentally, I was beginning to care again, about wilting plants and injured animals and what people anticipated or loathed. Eating used to be like arm-wrestling with myself, the defending champion you damn well know how your mother resents your eating your life away since you were born and now she knows that job security is a lie she hates still having to feed you because she’ll never have a good life like she did as a rich kid, the challenger of but I’m going to faint and they’ll notice and fuss and blame me (which might not be unwarranted, but certainly doesn’t inspire more positive changes) and I’m shitting bloodclots from the ulcers. If I could muster up the temerity to request therapy and psychiatric medication, I could eat. The oils around meats tasted awful to me, but fine to everyone else who knew it to be my favorite. Eggs and dairy products took on a cloying texture that I couldn’t bear. Fish was barely tolerable. My psychiatrist told me that she’d never heard of a side-effect like that. I went vegan, and carried it on for far longer than the aversion and tastebud weirdness alone would have kept me away from real proteins. I considered the lifestyle change a result of some spiritually superior calling, which I’ve got to admit was a huge mistake. I’d described to my therapist long ago what the mind fog felt like, like white mold growing on the inside of my skull so I could only find the fuzzy outlines of my thoughts. She suggested, knowing what an iron-cast meditative practice I had, visualizing a way to make that mold go away. I’d made a metaphor out of my experience, couldn’t I make an experience out of that same metaphor? No. No, I could not. It was neurological, biochemical, not a matter for the quests. I’ve read that some people find half an hour of meditation effective in doing away with what they describe as brain fog, and I envy them. I ran away from home to home and to almost homelessness. I had a roof, at least, and walls, but could only afford to eat so little that my fingernails began to splinter as they grew from the quick. The brain fog came back. I could have a whole meal for slightly cheaper than a single antidepressant pill, and ought to have the meal instead, if the brain fog was from malnourishment rather than depression. It was that sort of way of working within financial limitations. The fog felt familiar as depression, so I took the meds on an empty stomach. I needed a clear mind to work. Besides, a fusion deity of Hela and the Morrigan was wandering around my room, and I was beginning to get the sense of what She really meant. I named her Lady Hawthorne. Nausea had always been a side effect, but this time it was surprisingly incapacitating. It’s amazing how nauseous a body can get without vomiting even stomach acid, and by “amazing” I mean “torture” and I can’t brag about it as a feat, really, it’s more like a betrayal: How could my corporeal fetch do this to me. Why would my corporeal fetch do this to us. I wanted to die. Once it passed, I decided against taking the other half of the pill when I was supposed to, and I still wanted to die, but at least I wasn’t nauseated. Before it passed, I sat on the floor and leaned into the corner, trying to breathe as slowly as I could without fainting, because inside movements made the nausea wane, which meant it would wax full right in a trice. I was trying to keep the nausea steady until it flowed away, like trying to find a part of a river that flowed without ripples. I’d been reading about the Ophelia, a modern god of rivers (of course: the greatest civilizations in human history formed around a river or two), time, death, and depression. Depression had taken on a broader definition to me: the cold and hollow exhaustion of anxiety, the eroding attention and memory, the restless slumbering. The suicidal ideations, that’s what Lady Hawthorne attended to. The Morrigan aspect of this fusion god represented the battle, the aspect of Hela (from Proto-Germanic *haljo “the underworld” … Literally “concealed place” compare Old Norse hellir “cave, cavern”, from Proto-Indo-European *kel- “to cover, conceal”) represents the hidden nature of this particular kind of battle. When I thought about the Ophelia as a god of depression, this included the recovery, no matter how nauseating. Time and death, too, it occurred to me had life as an integral part, at least the way my nascent headcanon of the Ophelia claimed. Should I die of natural disaster, injury, illness, or age, I expect to glimpse the Ophelia in that last moment. If I kill myself, I’m the Helrrigan’s. And if I starve to death in self-imposed poverty rather than eating disorder comorbid with obsessive compulsion (or depending on who you ask, choice)…? Eh, how many angels can fit on the head of a pin. They were both in my room then, new gods perhaps summoned by new rituals and new ways to travel so far beyond your ken into the realm of horribly wrong. We three got through it all right. We’re still getting through it all right. All three of us, around this. To share anything—performed, expressed, or explained—no matter how artfully, takes something apart from the lived experience. That dissociation remains valuable. and it was just a thought, just a thought, just a thought, just a thought, just a thought. It’s okay, it’s okay, it’s okay, it’s okay, it’s okay. We can watch (we can watch) we can watch (we can watch) them go by…from here, from here, from here. Was this Erstvale, Surreal? Whatever. It had trees on turf. I’ll call it Erstvale. Beyond the corner of my eye, unhorsed ballerinas swathed in gauze and mist keened faintly for blood. The last time I saw them, they seemed to be kicking body parts around, and chasing where the others kicked. There may have been some splattering. Now, they seemed calmer. Queen Myrtha stood uncharacteristically still in the clearing, and spoke with uncharacteristic legibility. She and Giselle were never too far from one another, even when they seemed so. The Queen held up an unbroken, unstained hand-mirror and silently asked what I saw. YOU CAN’T SEE A MIRROR!!!!! That sounded more like Queen Myrtha. No quotemarks to contain her speech; it’s as though the fabric of the multiverse is screaming. It comes into mind bypassing the ears. You’d be surprised what you can get used to. I couldn’t. The forest I thought was filled with mist was really more like filled with infinitesimally small snowdrop-beads, moving in wreathes. Some things in the Surreal world do function the same way as the Corporeal, maybe because I think they should…even though I don’t want my tongue to have frozen stuck to a warlord fairy queen’s mirror. 1.) What you think of yourself. 2.) What others think of you. 3.) What you think others think of you. No reason this list should exclude “what others think you think they think of you” or “what you think others think you think they think of you” or even “what they think you think they think you think they think of you”. What they each think of themself is their bailiwick. She raised the hem of her dress slightly and looked down at her shoes. They couldn’t be real glass, or else she’d be hobbling towards some emergency first aid by now. Nor were they transparent. The human foot is a useful organ but is not, except to some people with highly specialized interests, particularly attractive to look at. The shoes were mirrors. Dozens of facets caught the light. Two mirrors on her feet. Magrat vaguely recalled something about . . . about a witch never getting caught between two mirrors, wasn’t it? Something she’d been taught, back when she’d been an ordinary person. Something. . . like . . . a witch should never stand between two mirrors because, because, because the person that walked away might not be the same person. You were spread out among the images, your whole soul was pulled out thin, and somewhere in the distant images a dark part of you would get out and come looking for you, if you weren’t very careful. The moment Queen Myrtha frees me from the fairyland mirror that has connived my capture, I can move onto more Intermediate Mirrorwork. Preferably with the Dierne, instead. 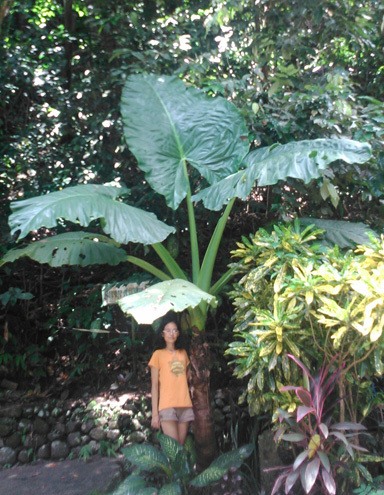 After an entry about santol fruit, I wanted to write up a local myth about the taro plant. Taro is best-known as a root crop that may or may not be purple, although I know a recipe that stews the very green leaves into mulch. (Dioscoria alata is definitely purple and a root crop, but called something else.) My research, which in this case means Wikipedia, suggests that taro is one of the earliest cultivated plants, its origins being Malaysian although cultivation has spread as far as the New World since then, whether by trade routes in Oceania long Before the Common Era, or because colonial masters said so. It could be interesting to consider, because the story I know has an Engkanto in it, and I’m not entirely certain that’s an indigenous folkloric being. Neither do I know how strong the connection ought to be between the story about the plant and the corporeal plant itself. If this is a Philippine myth about a Malaysian plant, and Malaysia is like right there, why is this story so Spanish? In the version of the story that I picked up by osmosis, the taro plant is known as gabi because of a girl named Gabriella whose nickname was Gabi. The stress is on the wrong syllable to suggest any association with the evening (gabi) which has more Austronesian vowels than Indo-European etymology anyway. An Engkanto tried to flirt and seduce Gabi into the otherworld to be his wife, and she said something like, “no thanks”. So, the Engkanto cursed her into a plant. Her toes became underground tubers so that she could never move from where she’d been cursed, and also they’re maybe sometimes purple? The plant’s leaves would be heart-shaped so that the whole world would know what her heart was like. The rain would fall upon the leaves and roll off, like his rain of love and attention upon this shrewish soul-eating harpy who couldn’t appreciate it. When her heart softens to him, Gabi can become human again. Obviously, it hasn’t happened yet. But how can this curse not have already been broken? Hasn’t this otherworldly suitor been so charming??? Seriously though, there is no story I know about Engkantos that tells of them being anything other than total dickweeds. I think this is a gabi plant but they’re not usually so large. The point was that even a parrot can pray. Human churchgoing Catholics should pray with meaning in their hearts, and with a mind to community and humility rather than bargaining with a cosmic God for selfish purposes. The Paternoster goes “give us this day our daily bread, forgive us our sins as we forgive those who sin against us” and “thy will be done” not me and mine. I want to say that Catholicism is complex, not inconsistent or contradictory, because so is life and the universe and everything. Still, it strikes me as suspiciously convenient to couch attractive and advantageous offers in terms of this religion—and then that anyone can cut down what they don’t like, also in the terms of this religion. Whether someone has the real goodness of the One True God in their heart and live the One Truly Proper Way, or if someone’s being led astray by the Adversary, becomes most obviously (to me, anyway) a matter of “yuh-huh” and “nuh-uh” back and forth into infinity about every little thing and big thing. If I could decide, I should pull a Joan of Arc and protest against the cultural effects based on guidance from living half in Christian otherworlds, not play to cultural and bureaucratic stigma while half living in fairyland. He probably has a point, but that doesn’t mean he’s not also melodramatic, and I hate dismissing anything as “just drama” because I have had some very real suffering treated that way, and feel as though that horrid phrase should never ever be possible to pronounce or spell. Then some abusive corporeal offline people I used to know really tempt me to say it, and the internal fracturing of my principles get me rocking back and forth while humming the theme from Galavant to soothe the turmoil. And after I’m soothed, I still don’t know right thing to do. Because I don’t want to put out there that I don’t believe it if someone says we’re over and done with. But after that I lay in bleak and speechless conviction of my uselessness in a probably godless world anyway, and Foxglove kept prodding my head with a finger and saying that the high seas, at least, were his if they were anyone’s, and if I went on some paracosmic adventure right now then real-life Neo-Imperial China would quit the shenanigans in international waters. “Stop giving me delusions of grandeur,” I’d muttered. But after that he stood outside church during mass and criticized the choir’s song selection. He doesn’t even usually go to church with me in what I call the otherreal. He doesn’t even have a corporeal human body, let alone a consistent disability to complain pointedly about. He is such a drrgrrargh! What if the constructed associated meanings are misleading? I have felt what I describe to be a hollow pain in my chest when I tried to go vegan: It was a vitamin deficiency. I have also felt a hollow pain in my chest related to emotion. They’re both hollow pains in the chest, but they’re different hollow pains in the chest in ways I don’t have more words to explain right now. This time, I intuited it to have some otherworldly overlap, so I went there in my mind and reached around and took the pain-thing out of my fetch’s chest. It looked and felt like a sheep’s heart I dissected in biology class once, except the incisions came down from the big top end and met at the ventral node-tip part. They hung like a cartoon octopus’ tentacles, and flopped fleshily like flat noodles. Well, I thought, It’s better than the black-gray goop that I usually get! So, I went to my library, because it seemed the likeliest place to find a stapler, rather than Erstvale or Foxglove’s ship. 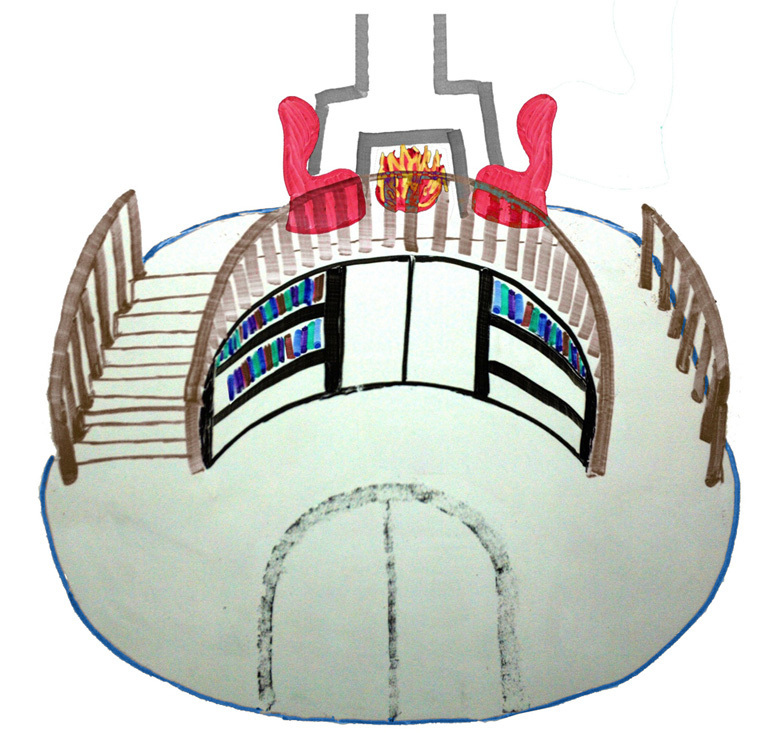 I didn’t draw the furniture above because I don’t always know exactly what’s in my own sort of Surreal Save Point. One time it was zombies. My therapist thinks it Means Something. This time, there was a conference table between the door to the inside of the crescent bookshelf and the door to outside the library (as there usually is.) A chess set rested on the round table by the window in front of the mezzanine stairs, although their players had gone a long time ago. Up on the mezzanine were more bookshelves, a fireplace and armchairs, and a glass casket containing an ostentatiously ugly gown. The poop deck had maps, pencils, calligraphy brushes, sextants, astrolabes, pocket watches, Victorian keys, for some reason a weather vane and an orrery—but no stapler that I could see, and Foxglove wasn’t even looking for one. He just kicked over a trap door to another cabin and dropped through. I followed. He found a sewing needle and a bit of yellow-beige fluff in one of the caskets. I sat on the table and waited as he got out a bit of paper card. With one hand, he began to twist the fluff into thread and I groaned. His hook had no trouble catching more fluff, and eventually the card was covered in a spool of looping thread. Eventually. Very eventually. “I’ve got an REM cycle to catch,” I said, as he took a threader out of the casket. He shrugged and grasped the needle in his teeth. I said, “Maybe it’ll be faster if I did it—” because my fetch had two hands. He shot me a disdainful expression and threaded the needle, then held his hook out for the heart. I hung the heart on it by an artery. He started to sew. Having watched a pet kitten get stitches at the vet’s office after a bad fight with another cat, I did get the idea that sewing up flesh was different from sewing up fabric: each stitch is separate, so pulling one stitch wouldn’t pull the others along with it in a continuous running line. After swinging my legs over the edge of the table for a while, I glanced over at how Foxglove was sewing, and saw that he was embroidering long stitches so close together that they looked like hatch-shading. I didn’t want to tell him. I don’t even want to tell you right now. So we lapsed into a silence awkward to me, but I think Foxglove already knew because he had this smug grin all the rest of the while he continued sewing. Eventually I got bored enough to flop down on the table and bounce my head against the wood. Then Foxglove paused to take out his broken pocket watch, then made a face of dramatically exaggerated shock at what the unticking clock’s own face showed the time of. Then he politely left the cabin, and the heart half unsewed on the table. And I felt better, so there. I really never know what’s going to be a Significant Otherworldly Exploration Discovery Event Development and what’s just zany and goes nowhere, but this did seem like it would be an entertaining anecdote, so here it is.